Jaswant Thada was built in the year 1899 by Sardar Singh, the ruler of Jodhpur in the memory of his father- Maharaj Jaswant Singh. It is located to the left of the Mehrangarh Fort complex. It is considered to be one of the most striking architectural buildings which are located ideally in the city of Jodhpur. 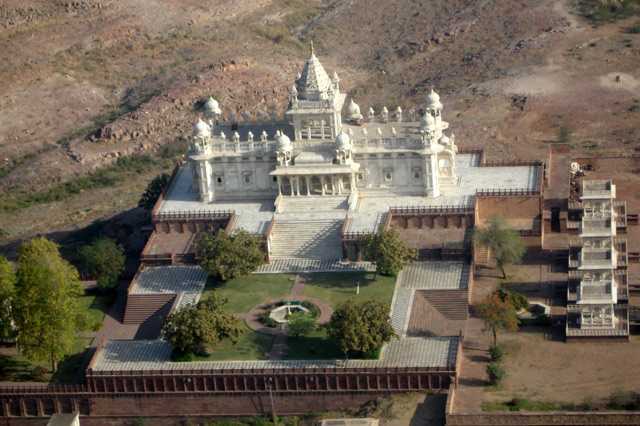 Build in pure white marble, the Jaswant Thada is the burial ground of the early Jodhpur rulers. The royal crematorium is also located near to the place. The entire structure of Jaswant Thada is built with intricately carved marble sheets. Made with ultra thin marble sheets, the monument is elegant and polished. It glows with the fall of sun rays on the outer surface. There are exquisite marble works on the cenotaph of the monument. The entire monument resembles a temple with its architectural structures and carvings.